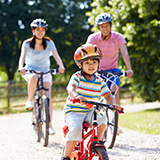 The Community Preventive Services Task Force recommends combined built environment approaches to increase physical activity. These approaches combine new or enhanced transportation systems (e.g., pedestrian and cycling paths) with new or enhanced land use design (e.g., proximity to a store, access to a public park) to promote physical activity among residents. The Task Force finding is based on a systematic review of the evidence that showed combinations of activity-friendly built environment characteristics are associated with higher levels of transportation-related physical activity, recreational physical activity, and total walking. The review was conducted on behalf of the Task Force by a team of specialists in systematic review methods, and in research, practice, and policy related to physical activity. What are Built Environment Intervention Approaches? Built environment intervention approaches to increase physical activity create or modify environmental characteristics in a community to make physical activity easier or more accessible. Why is the Task Force Recommendation Important? Despite the benefits, less than half of all adults, and 3 in 10 high school students in the United States, get the recommended daily amounts of physical activity (Carlson et al. 2010; CDC 2014 ). What are the Task Force and Community Guide? The Community Preventive Services Task Force (Task Force) is an independent, nonfederal, panel of public health and prevention experts whose members are appointed by the director of CDC. The Task Force provides information for a wide range of decision makers on programs, services, and other interventions aimed at improving population health. The Task Force was established in 1996 by the U.S. Department of Health and Human Services. Although CDC provides administrative, scientific, and technical support for the Task Force, the recommendations developed are those of the Task Force and do not undergo review or approval by CDC. The Guide to Community Preventive Services (The Community Guide) is a collection of all the evidence-based findings and recommendations of the Community Preventive Services Task Force and is available online at www.thecommunityguide.org. Carlson SA, Fulton JE, Schoenborn CA, Loustalot F. Trend and prevalence estimates based on the 2008 Physical Activity Guidelines for Americans. American Journal of Preventive Medicine 2010;39(4):305–13. Posted in Featured, Resources. This entry was tagged exercise, healthy. Bookmark the permalink. Next: Go: Arabia Mountain PATH Trail + 17 others!